Four versions of GrooveMaker are currently available. PRESS RELEASE: IK Multimedia is proud to announce the launch of GrooveMaker® for iPhone/iPod touch - the revolutionary app that allows you to create and share non-stop electronic, dance and hip-hop songs on the go in real-time just like a professional DJ or music producer. 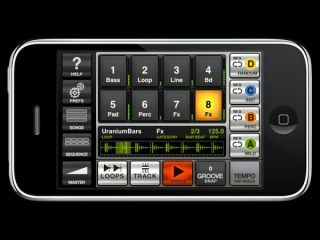 GrooveMaker for iPhone/iPod Touch - a full porting of the previous Mac/PC application from IK - gives you a completely new way of making music with audio loops. Thanks to our patented "groove generator" technology, you can automatically remix the hundreds of loops included, on the 8 available tracks, in virtually limitless ways, all with one touch. With GrooveMaker, you can create professional full-length tracks and grooves for your music compositions, ambient soundtracks, movie scores and more. And it's so easy to learn that you'll be creating your songs and remixes in minutes. Everything in GrooveMaker is done in real-time, without ever having to stop the music. It's like working with a real instrument! You can add, remove, and replace single or multiple loops as you listen, so there's no stopping to your creative flow. GrooveMaker makes remixing a breeze and a totally new experience. Composing is as easy as "drag and drop" and puts you at the controls of the music. It's your mix, and it all happens in real-time. Pick a drum groove. Layer on a bass riff. Add a bass drum beat. Spice it up with melodic and rhythmic lines, leads, pads or effect loops. Browse millions of grooves with one click and pick the ones you like. Change tempo on the fly without stopping the music. Then save it all as a new remix and export it to your Mac/PC. Get instant updates and bonus contentplus chat with the team. Start here!